Vincent Kompany wants to continue his career next season but is content to delay discussions over a new Manchester City deal. The 33 year-old has been at the Etihad Stadium since 2008 and reports earlier this year indicated he will be offered a 12-month extension. However, Pep Guardiola has previously warned the Belgium international will not be retained purely for sentimental reasons, with injury issues having restricted him to nine Premier League starts this term. "I'll be playing next season," Kompany said when asked about his future by talkSPORT, though the centre-back did not specify where. "I'm part of the [City] family now, so we'll deal with this situation as a family. "We might agree or disagree, but it won't change any of the relationships between me and the club. "But it's not a priority right now. One guarantee is that I will be playing and trying to win more trophies." 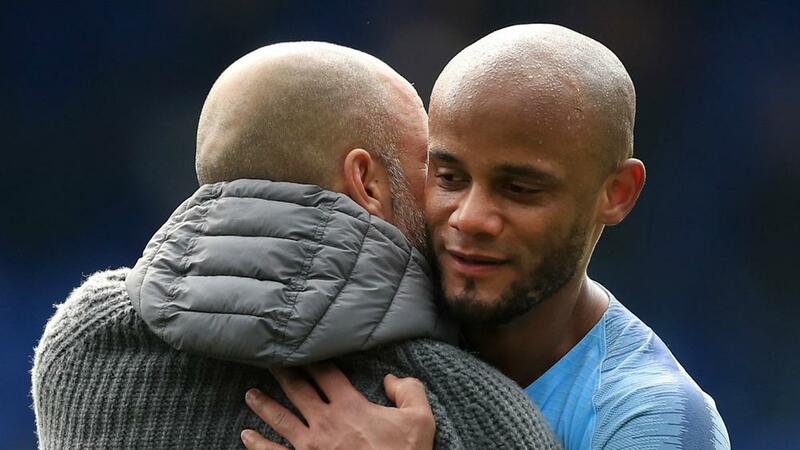 Kompany played 90 minutes in the 3-1 win over Crystal Palace on Sunday after watching from the bench as City slumped to a 1-0 loss in the first leg of their Champions League quarter-final tie against Tottenham. The ex-Anderlecht and Hamburg man is confident the deficit can be overturned when the teams reconvene in Manchester on Thursday (AEST). "Of course we can, but it will need to be a special night," he said. "I look at Wednesday and for me it's a night of opportunities. You go into these games and you know you can do something special. If not, why are we in this game?" And manager Guardiola is equally confident of progressing to the final four. "If you ask me what is going to happen, we'll be in the semi-finals. That is what I feel right now," Guardiola told Sky Sports. "It's what I felt right after the game and when I reviewed the game. Maybe I'm wrong but what I feel now, we'll be in the semi-finals. "The [first-leg] result is not ideal but it's not a disaster. We are able to score goals and we are going to do it."